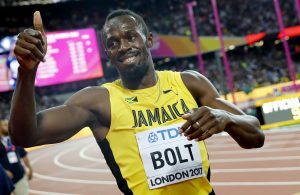 Usain Bolt, the global track superstar from Jamaica, ran the last race of his career on Saturday at the 2017 World Championships in London, placing third. The race punctuates a record-breaking career spanning three Olympic Games. Bolt, 30, ends his reign with nearly every award a runner can win. He holds world records in the 100- and 200-meter sprints. His fastest 100-meter time – 9.58 seconds in Berlin in 2009 – was a full tenth of a second ahead of the second-place finisher. He has set records with Jamaica’s 4×100-meter relay team, and is the only individual to win both the 100 and 200 in three consecutive Olympic Games. In total, he has placed first at 11 world championships. Bolt’s final 100-meter race, which he finished in 9.96 seconds, was several tenths off his personal record. He placed behind Justin Gatlin and Christian Coleman, only the second time in his career that he has lost a championship race (the other was in 2011, when he was disqualified after a false start). While it was his running that first attracted attention, it’s his persona – free-wheeling, joyful, celebratory – that locked the world’s attention for nearly a decade, elevating the runner to a level of global stardom reached by few athletes. After races, and sometimes even in the middle of them, he was known to look directly into the camera and grin. Whether Bolt commits to retirement–world class athletes have been known to renege on the decision, like Michael Phelps before the Rio Olympics–his legacy is expected to endure.